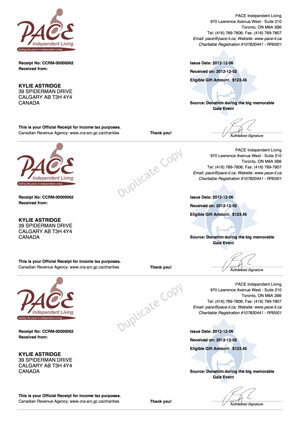 This module produces CRA compliant Tax Receipts. It's currently housed in the Drupal Sandbox: http://drupal.org/sandbox/semperit/1289724 - lots of development on its way to include more features and to bring it up to the level of a full Drupal project with stable releases for both D6/D7 and a variety of CiviCRM versions. After these releases future development will focus on making this into a CiviCRM extension. The module was developed in close cooperation with a senior accountant (partner at a major firm) who consulted CRA (supervisors) on a number of occasions - though we are confident that the module is meeting CRA's current guidelines for Tax Receipts re: Charitable Donations, all users of this module should remain dilligent about keeping informed on CRA's guidelines as they may change in future. 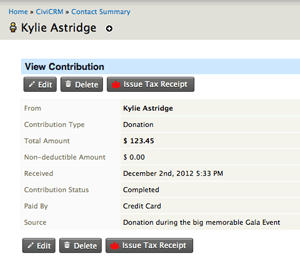 The module puts an Issue Tax Receipt button in the View Contribution Screen (see below). Upon clicking the button receipts are issued: Downloaded to the Staff's computer; Emailed to the Donor; Emailed to the organizations archive. This work has been made possible by many organizations: such as La Leche League Canada, PACE Independent Living and Wildsight and by many individuals and the companies they work for: Karin (Semper IT inc.), Alan (Alan Dixon Consulting), Jake (Peaceworks) and Lola (Freeform Solutions) to the team.